Century Farm | What a Beautiful Mess! This year marks the 100th Anniversary of the farm being in the family! I’ve lived here most of my life and can’t imagine living anywhere else! The ground I walk on holds the history of my family and it all tells a tale when I look around and remember the past. It’s all changed with time, my years here have seen changes, so I can’t imagine the memories my Mum must have now that she’s living in the house she grew up in. The actual farm yard is massive and takes more work than I have the energy to do most days, but I keep at it and try to make it the showcase it’s always been. My Granddad spent countless hours making it look it’s best, if for no other reason than pride in the work. The massive amount of trees to take care of is the one overwhelming job that I happen to be working on now. With 100 year old maples and row upon row of hedges, the maintenance is an ongoing job, but I work at it slowly and do what I can. I’m not sure what the future holds for the farm. I have no children and my sister doesn’t either, so this is probably the end of the line for it, at least as far as this family goes! But, things change and evolve and the one thing that never stops is time marching on! I’ve created a little area here for me to take time to enjoy the garden and ponder life, just as my real life home has areas such as this! The latest group gift from KraftWork was the start of it and I just added things I’ve gathered up over time. The ‘Water on Tap’ hydrant set includes three rustic taps with varying degrees of aging, ranging from new to middle age and then the aged, which is seen here! It seems to have developed a drip, which I’ll have to get Dad to have a look at! ;D It has a land impact of 2 and is copy/mod! The group is 25L$ to join, which is a mere pittance when you see the incredible group gifts that are released regularly! * also from KraftWork is the Bakelite Vintage Radio from the Vintage Radio Gacha set. * the ‘Garden Retreat’ is from .:revival:.. I just adore their rustic and homey garden and home decor. Also from .:revival:. is the Book Pile, leather, which is part of a gacha set. * I have quite a few things from hive// on display here. 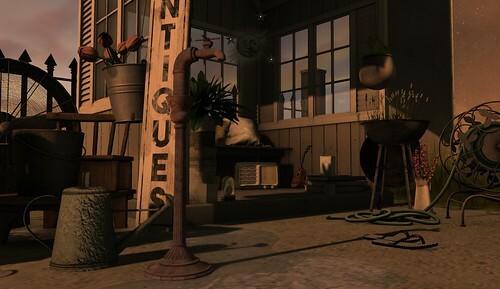 The ‘vintage garden hose cart,unravelled, the milking stool, country drum fan, and ‘Antiques’ sign are from various gacha sets. * the ‘Hanging Fern Pot’ is from Miwa’s Airship from the Spring Countryside gacha set. * the Ukulele 3 is from the ‘Summer in the Sun’ gacha set, from Reign, it’s available til the end of the month at The Arcade. * the ‘Overgrown Stacked Buckets’ and ‘Overgrown Grill, RARE’ are from nefarious inventions, which has closed but you’ll find their gacha sets available at the main store of Disorderly..
* the ‘Garden Gate’ behind the garden retreat is from [we’re CLOSED]. * the watering can is from the ‘Oh My Garden’ gacha set from Shine. I looked all over the main store to see if it was still available, but I couldn’t find a gacha. So I’m not sure if you can still get it. * the ‘antique jug of flowers’ is from Amala. * you can see a little bit of the ‘meadow grass’ from Raindale! This is the ‘summer, rich’ style and it’s so lush and green! *the flip flops, black/white is from the ‘Poolside’ gacha set from Pilot and available til the end of the month at The Arcade. * you can just see one corner of the ‘Huguette Bag’ from C’est la vie. It was the FLF items this past week. How nice to have that history of where you’ve always lived, Liz! I’ve moved around so much (dad had lots of jobs mainly in the East – being a geologist he got jobs wherever he could and then moved on), I feel that I don’t really have a homeland. I’ve been in the UK for the longest time. I bet your farm looks fantastic, though, all those trees must be amazing if a lot of hard work. Do you keep beehives? I’ve never had bees, although I do remember extracting honey as a kid when my Granny did. It’s become quite popular here for people who live on acreages to get a hive or two for fresh honey. I probably never thought about it because I’ve always wanted animals the I can name and hug. It’s hard to hug a bee! 🙂 The yard is gorgeous when in it’s prime, which is July and August. Anyone who visits says it’s like being at the lake, except we don’t have a lake!